The last two months of posts have been a solid block of Ask Lunas, but now that the backlog’s clear (or almost clear), here’s an update on Book 9! Alex Verus #9 is currently on step 4 of the publication process, i.e. edits (if you’re curious about the details of what that means, take a look here). Probably more relevant to you guys is that we have a provisional release date, namely June 2018. Here are the book’s pages for Amazon UK and Amazon US, though at the time of writing the Amazon US page is still a placeholder. There’ll be an audiobook edition as normal – I’ll post the release date when I know more. We also have a title! 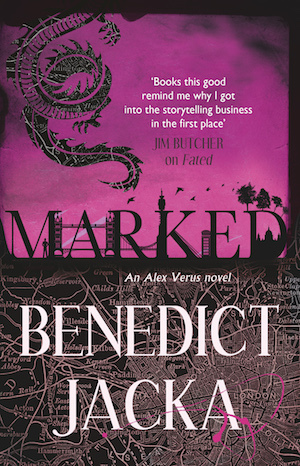 Book #9 will be called Marked, and here’s a look at the UK cover. The eagle-eyed among you will have noticed that the UK cover style’s changed a little from the old days. The exact point at which the switchover happened was Burned, and Orbit are planning to re-release the earlier books in the new style at some point in the future. For those of you who have the current versions of books #1-#6, this means they won’t match perfectly on your shelves any more, but on the plus side they’ll eventually become collector’s editions. As usual, I’ll put up the first chapter of Marked on this site somewhere around April-May. Ooooooooo I see a dragon!